Pargo is a logistics company that collects parcels from your premises and ships them to designated pick-up points, where buyers collect them during working hours, at the time that suits them best. These so-called Pargo Parcel Points are located in well-known retail outlets throughout the country. In order to offer Pargo as a shipping option, sellers need to register on the Pargo website and then request to be added to the Pargo group of sellers on bidorbuy. Sellers can offer Pargo as a shipping option on all or some of their products via their shipping table. Buyers select Pargo and choose a preferred Pargo Parcel point when purchasing the item. The seller must package the item and notify Pargo for collection. Pargo will collect the item from the seller and deliver it to the buyer’s chosen Pargo Parcel Point where he/she will collect it. Step 1: Register on Pargo by e-mailing info@pargo.co.za. Step 2: Request to be in the Pargo group of bidorbuy sellers by e-mailing hello@bidorbuy.co.za. Step 3: Pargo will automatically be added to the your shipping table. You can enable and disable Pargo for different product classes. Step 4: Only once payment has been made, a green “Release to Pargo” icon will appear next to the order. You must click this green icon to notify Pargo to collect the item from the address entered on bidorbuy. It will take one working day for the courier company to collect the item. Step 5: Click “Shipping Waybill” to open up a window with a Waybill specific to each order. This must be printed and pasted on the item before Pargo come to collect. What happens if I don’t have packaging materials? 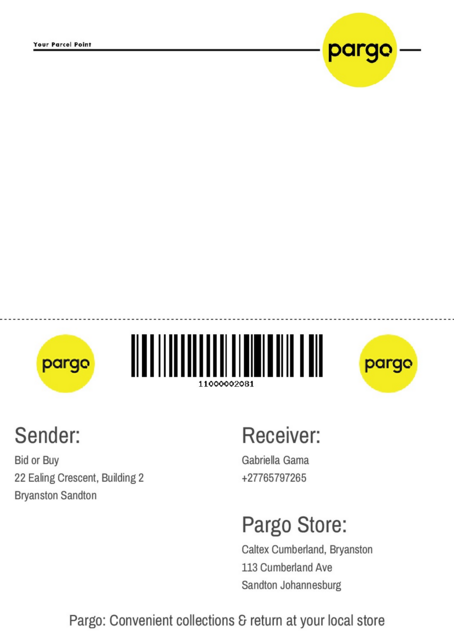 You can purchase sleeves from Pargo (R1.35 each) prior to collection. You can put the item/s you need to ship into those sleeves, using one sleeve per order. (Please see rates and size limits in the Sellers, please note section below). How do I track my item via Pargo? Sellers must purchase new Pargo Waybills on a case-by-case basis or in bulk directly through Pargo. Sellers must send a Pargo Waybill to a buyer who wants to return an item. Whom to contact for help when using Pargo as a shipping method? Sellers, please email hello@bidorbuy.co.za if you need help using Pargo as your shipping method. Pargo will hold a parcel for 14 days maximum. If not collected, parcel is sent back to sender. Pargo is not responsible for any loss or damage to the parcels.